Oil on canvas, 33-3/4" x 27"
"Vitality" is the best descriptive word for the paintings of Frans Hals [1580-1666], one of the most famous artists of the Baroque period of art in Holland. 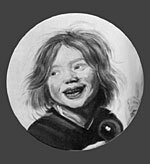 He is popular throughout the Western world for his portraits of laughing people. A master at handling brush and paints, he was able to capture a laugh, a gesture, or a sparkling eye, and fix it on canvas forever. 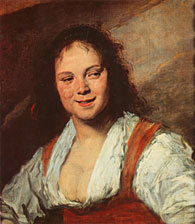 Happy-go-lucky Hals did not usually penetrate a subject's character as did his contemporary, Rembrandt, for Hals lacked his poetic vision and searching curiosity. But when you view one of his pictures today, more than three centuries later, the person still seems vividly present. 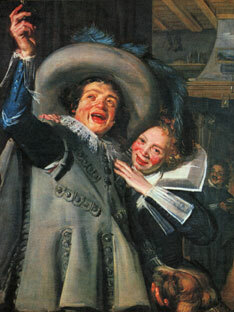 A laughing Hals print on the wall is like having a merry companion in the room. In Haarlem, Holland, a scholarly teacher named Karel van Mander, who knew the art of other countries, passed on his knowledge to the young painter. 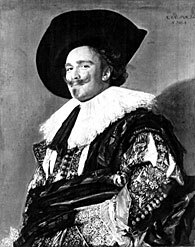 Hals was also influenced by his great Flemish contemporary, Rubens, who visited him in 1624. Hals' technical ability was supreme, each brush stroke sure. His paintings glow with rich blacks, silvery grays, and subtle whites; and the skin tones are in bright tones of red, pink, and yellow. The times were prosperous, so portraits were in demand. Hals became a very successful, fashionable painter of wealthy citizens. For his own pleasure, in the taverns where he passed the time, he swiftly sketched noisy companions and troubadours strumming guitars, lifting glasses, or singing drunkenly. Hals had more than eight children, and five of his sons became artists. He made money painting and teaching, but lived lavishly and spent his earnings recklessly. As he grew older the demand for his work declined. In his eighties, Hals lived poorly on a small pension given him by the city of Haarlem -- where he spent almost his whole life -- as a token of the fame he had brought there years before. Long after he died, his laughing faces and fine portraits won him a lasting place in the history of art. [In "Yonker Ramp and His Sweetheart,"] Hals captured the gay gestures of a young couple. . . . The brushwork is rapid and skillful. The artist designed the picture brilliantly, in a typically Baroque manner: he made a diagonal leading from the man's upraised right arm, to his sweetheart's hand, down to this left hand under the dog's chin. In this way a lively composition is created, and the viewer is made to follow these lines into the depth of the scene, so he will see the warm fire and the laughing servant.